We’d love to see our fans at State supporting the guys! But the State meet can be a crazy atmosphere, and with everyone still getting used to the new location – this is more true than ever! So we’ve shared some tips and extra info to help! The state meet kicks off at noon Saturday (2/09). The state swimming qualifiers and coaches will leave Lincoln by 7:15 a.m. to be in Iowa City by 9:00 a.m., which is when the pass gate opens. Admission is $10 per person. Each school can order advanced tickets with two options – over the competition pool and over the warm-up pool. Competition pool tickets are limited to three tickets per qualifying swimmer. That means this year – we are receiving 15 tickets that will be all together over the competition pool. Warm-pool tickets are also sold in advance and should be seated together. Children 3 and over will require a ticket to be in this section of the meet. These tickets have all been ordered and reserved, as of Sunday (Feb. 3) at noon. General admission tickets are behind the glass and in the gymnasium across from the pool arena. They are not inside the arena and will not have “cheering sections” with fans from the same team all sitting together (like above). New for 2019 – These tickets can be purchased in advanced! However for our team, these were also due Feb. 3 at noon. So the team/Lincoln will not be taking orders for advanced GA tickets this week. If you’d like to have GA tickets to the meet, purchase them onsite. Just remember there is no seat assignment, nor can there any saving of seats in the general admission section, regardless of when they were purchased, in advance or day-of. Doing so will result in your removal from the meet. So we encourage you to be ready to take your spot before the doors open at 11:00AM. We believe that wristbands will be issued and must be worn for the entire meet. Children not yet in school will not require a ticket for this section. Because of this new ticketing procedure, there will be no auxiliary gym for waiting spectators. The doors will open at 11:00AM and that is when general admission tickets will go on sale. If you can’t make the drive, meet results should be available in Meet Mobile and will also be posted in real time on the Association’s website – http://www.iahsaa.com. The meet will be video streamed live on the internet through the NFHS Network. Please go to NFHSNetwork.com for more information. Send money with your athlete! State shirts sell quickly, especially in the popular designs. While the memo says shirts will go on sale at 11:00AM, we find it’s best to be prepared in case shirts go on sale early. State attire tends to be pricey – ranging from $15-$60 depending on if the item is a t-shirt, long-sleeve shirt, sweatshirt or quarter-zip pullover. Arrive early! We know there’s no gym anymore. But arriving early can allow anyone sitting in general admission to find a meeting spot, pay for their tickets together and go find seats together. You’ll be more likely to be able to sit in a group if you are there early. Remember, over 1500 people will be coming to watch the meet. Parking is different for 2019! Parking will be charged at a graduated hourly rate at all lots and garages around the CRWC. Check out the map of available lots. For those with general admission tickets, we recommend you pick a parking lot so you can park in the same area and walk in together. Be sure you enter the Rec Center at the right spot. Here’s an entrance and facility map. Use the green spectator entrance. Concessions, t-shirts, and programs will be available for purchase beginning at 11:00 AM. Programs for the state meet are $3.00. Looking for more detailed information? Check out the boys’ association website for State Swimming Information. There are several links to documents (some also linked above). 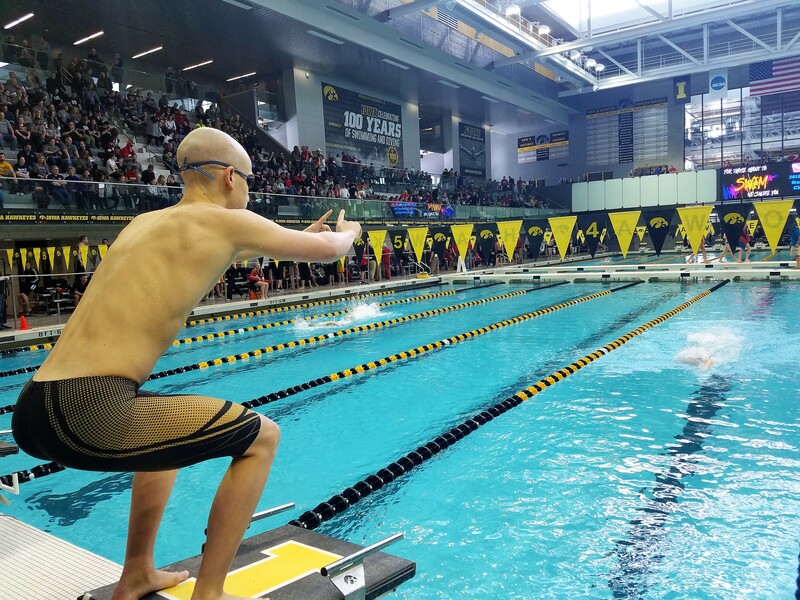 The most important details for spectators can be found here, State Swimming Spectator Information.